Designed with simplicity in mind, this is an ideal case to carry notebooks with screens up to 15.6", including a workstation. 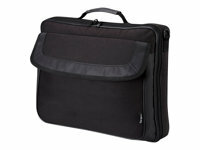 There is storage for all those essential mobile accessories and a padded lining to protect your laptop; this is an ideal cost-effective case. Features a riveted handle and removable shoulder strap with cushioned pad for improved comfort when on the move.